William Kelley, Detroit, Aloney Rus, E. Saginaw and D. W. Rust, Saginaw. 1873, Oct 13 Enrolled Cleveland, OH. 1877, May 7 Sunk schooner FRANCIS BERRIMAN in collision off Sturgeon Pt., 20 miles SE Thunder Bay, Lake Huron. 1881, Apr 23 Owned Menominee Transportation Co., Milwaukee, WI; towed L. C. BOTTS and D. K. CLINT. 1882 Rebuilt Wolf and Davidson, Milwaukee. 1884 Owned George Van Dyke et al, Milwaukee. 1885 Ran Escanaba-Ohio, ore trade. 1887, Mar 16 Owned Chapen Mining Co., Milwaukee; 1 11.5 x 16' @ 90# steam firebox boiler, John Mohr and sons, Chicago, IL (1887). 1890, Jul 15 Owned Interstate Transit Co., Milwaukee. 1892, Apr 9 Owned Lafayette Sullivan et al, Toledo, OH. 1892, May 19 Damaged by falling conveyer trest; lost smoke stack; replaced; towed C. C. BARNES and W. H. ROUNDS. 1892, Nov 29 Repaired at L'Anse, storm damage, Lake Superior. 1894, Jul 21 Grounded Squrrel Island, ore laden. 1895, Apr 25 Rig changed to 2 masts. 1898 Towed EDWARD KELLEY and CHICAGO BOARD OF TRADE. 1898, Sep Aground near Escanaba, MI with KELLEY. 1907 Towed C. C. BARNES, G. G. HOUGHTON and J. SCHUET. 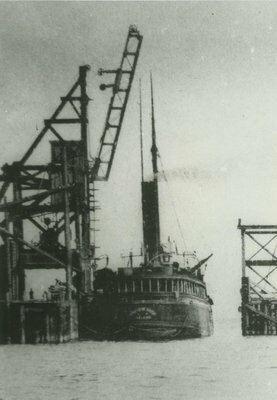 1910, Jul Owned Northwestern Dredge and Dock Co., Marinette and Albert Ceal, Duluth, MN. 1913 Dismasted and abandoned, Toledo, OH.